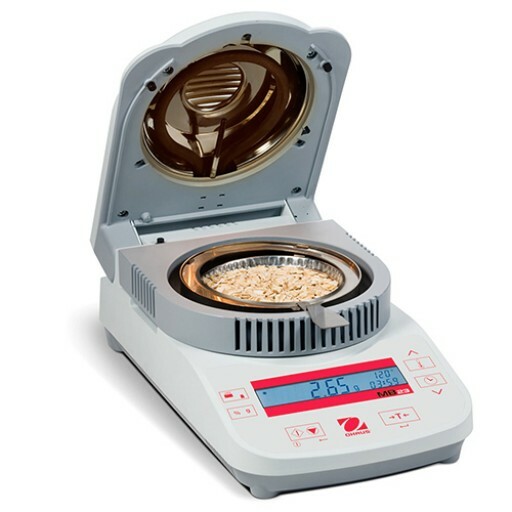 The OHAUS MB23 Basic Moisture Analyzers combine high quality and durable construction into a sleek, compact design. It offers dependable, accurate, results for a wide variety of applications. The OHAUS MB23 provides accurate results at either 0.1% or 0.05% readability. And with your infrared heating, its ideal for textiles, wastewater, ceramics, food and other applications that require IR heating elements and measurements to 0.1% or 0.05%. Set up and operation is extremely easy. Just press and hold the temperature or time buttons to set drying parameters, add your sample and begin the test process. This makes the MB23 ideal for routine tasks performed by operators of all skill levels. The compact footprint (17 x 13 x 28 cm) of the OHAUS MB23 is designed to take up less space. It's easy-to-clean heating chamber is ideal for frequent use and inexpensive maintenance.